When it comes to oils, the big hype is always generated around the ever so popular Olive Oil. Olive oil is indeed a very healthy form of fat (especially when compared with butter, margarine’s and some other oils), however it has a few drawbacks. First, it can have a very strong flavor, which makes it great for some dishes, but others not so much. Also, it has a low smoke point(1), making it less desirable for high heat cooking. Don’t get me wrong, the benefits of olive oil are great! It is high in cholesterol fighting monounsaturated fats, which have been shown to decrease LDL and possibly increase HDL. But what if there was an oil that had a better nutritional makeup than olive oil, AND wasn’t as potent AND had a higher smoke point for sautéing and cooking up some delicious scrambled eggs? You guessed it, it’s macadamia oil! 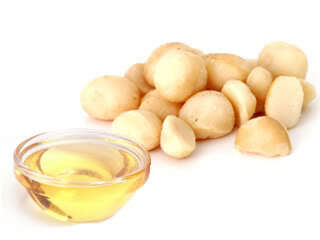 Macadamia is higher than any other oil in the cholesterol fighting monounsaturated fat. It is slightly higher in saturated fat, however this is from a plant form, and is pretty negligible. It is also much lower in Omega-6 fats than other oils, which is good because high omega-6 intakes have been associated with some cancers and cardiovascular problems. When it comes to smoke point: olive oil is around 325 – 375 F, depending on how processed it is. Macadamia oil sits at a nice 410 – 450F. This means it can be heated higher without becoming rancid. It has also been found to me MUCH more shelf stable than other oils. The flavor is much more subtle, but really REALLY good. It almost has a butter taste, and you can find some awesome recipes to use it in. I highly recommend it for scrambled eggs with sautéed veggies. Lastly: the price. Here is where it gets interesting. Depending on the quality and composition of olive oils, the price can range from about $0.40/oz. to $1.20/oz. 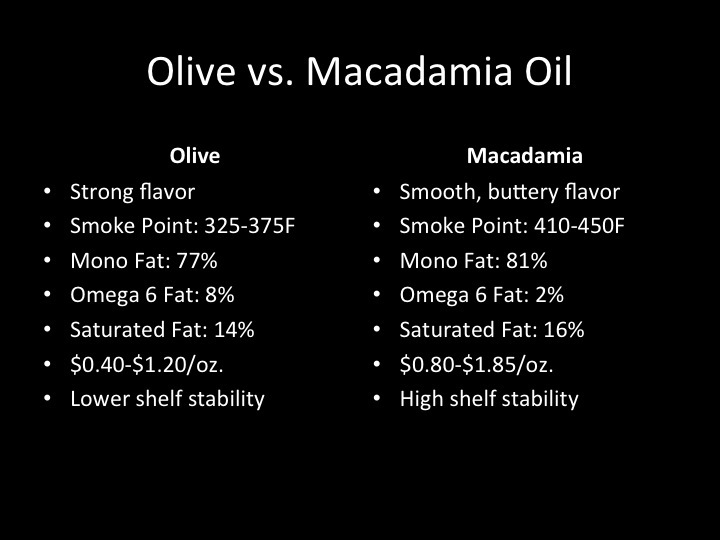 Macadamia oil ranges from $0.80/oz to $1.85/oz. The price could be a big factor, but for what it’s worth, the macadamia oil will last longer (don’t have to use as much) and also won’t go bad as fast. All in all, I think Macadamia oil is worth everyone giving a try. If anything, you can always use it to moisturize your skin (chemical free!) if you don’t like the taste! *Just remember, it is still a fat, so it packs 9 calories per gram, or about 40-45 calories per teaspoon. Now, we don’t need to go crazy and start deep fat frying everything (lots of extra calories!) – but, if you choose to deep fat fry the occasional foods, this article is money and will put you on the right track! This entry was posted in Nutrition and tagged cooking oil, diet, fat, macadamia oil, nutrition, oil, wellness by Mike Gorski. Bookmark the permalink.